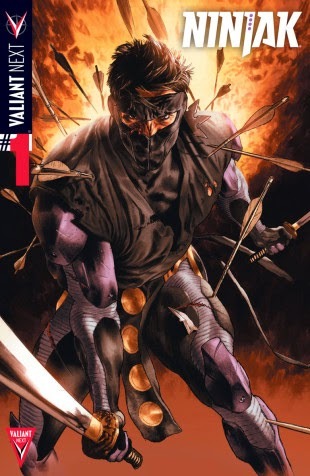 The Fellowship was fortunate enough to obtain a copy of NINJAK #1 from Valiant Entertainment. Matt Kindt writes, Clay Mann draws and Ulises Arreola colors. Ninjak is the world’s greatest infiltrator, but he’s also a guy named Colin King, former MI-6 operative and freelancer. Here we get glimpses into his past while we watch him work his way into a group known as the Shadow Seven, who are the leaders of a consortium of military-grade weapons manufacturers who sell to “the bad guys.” Ninjak is subjected to a series of tests of his resolve and loyalty, and the payoff is worth every bit of effort. Colin as a kid is pretty normal, or at least not far from the expected (though the movie theater scenes are really well done). Seeing him in action in the present is the cool part, though, as he’s really well written as the badass secret agent. And the art does a wonderful job with both the action scenes and the beautiful landscapes. Plus we get a bonus story, drawn by Butch Guice, from early in King’s espionage career. One of the (many) cool things about the Valiant universe is the wide range of styles they’re using. And I think they’re going to do well in the superspy genre with this book. NINJAK #1 is available now at your FLCS or at valiantuniverse.com.